Dec. 7, 2011—The following is the transcript of the interview ABC's Barbara Walters conducted with Syrian President Bashar al-Assad. It was his first American interview, and the president was asked about Syria's role in the Arab League and how he is treating protesters in his country. ABC's Barbara Walters: Mr. President, you have invited us to Damascus and you have not given an interview to the American media since this crisis began. What is it you want us to know? Syrian President Bashar al-Assad: I would like to reiterate what I used to say after 11th of September, to every American delegation I met, first of all I think the American people, people should know more about what's happening beyond the ocean, second the American media I would like them to tell only the truth about what's happening in the world, and for the American administration. Don't look for puppets in the world. Walters: Don't look for puppets? Assad: Only deal with administration that, on people that can tell you know about the truth, because what's happening in the world now is taking the world toward chaos, what we need now is we need to deal with the reality. So the message now is about the reality. Walters: Tell me what the reality here is your country is. What is the reality? Assad: It's too complicated, it takes hours to talk about... so let's be specific. Walters: Not long ago you were widely seen as a fresh pragmatic leader, a doctor whose life was in healing people, now sir, much of the world regards you as a dictator and a tyrant. What do you say to that? 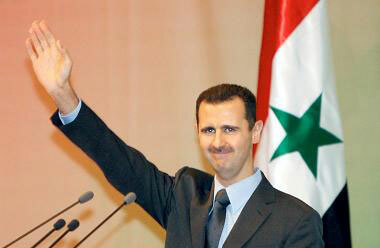 Assad: What's important how the Syrian people look at you, not how you look at yourself. So I don't have to look at myself. This is... second, it's about the system. You have a dictator and you have dictatorship, there's a big difference between the two, dictatorship is about the system, we never said we are democratic country, but we're not the same, we-- we are moving forward in, in reforms, especially during the last nine month, so I think we are moving forward, it takes a long time, it takes a lot of maturity to be full fledge democratic country, but we are moving that, that direction, for me as a person, whatever I do should be based on the will of the people, because you need popular legitimacy and this is against dictatorship for person. He could have been mistaken for a young business executive. Indeed, it was hard to imagine that the beaming figure in the dark suit who greeted staff warmly as he carried his own bags into the Tishreen Palace was anything else. Yet this was Bashar al-Assad, the Syrian president in whose name more than 3,500 people are said to have been killed in eight months of violence. Armed clashes have escalated to a point where last week Sergei Lavrov, the foreign minister of Russia, an ally, likened the situation to civil war. The contrast between the maelstrom of killing that has engulfed parts of Syria and the mild manner of the softly spoken leader presiding over efforts to contain it from his hilltop palace could hardly be more stark. He shook my hand with a smile, led me into a living room for tea and, having been briefed beforehand that my husband was ill, inquired solicitously about his health. “Have faith,” he said, gently. Only 15 miles from where we sat, the Free Syrian Army, newly formed by defectors from the ranks of Assad’s military, had just attacked an air force intelligence base in its most audacious operation to date. Assad, 46, is also under fire from international critics, not only in the West but also in the Middle East, where former allies in the Arab League gave him until yesterday to end the “bloody repression” or face economic sanctions. I asked him how he felt as a father — he has two sons, aged nine and six, and a daughter, aged eight — when he saw images of innocent children shot in the conflict. “Like any other Syrian, when I see my country’s sons bleeding, of course I feel pain and sorrow,” he said. “Each spilt drop of blood concerns me personally. As for the Arab League’s attempt to stop him, he dismissed it. The initiative, he said, was aimed at giving the international community an excuse to meddle in his country. “It’s been done to show that there’s a problem between the Arabs, thus providing western countries with a pretext to conduct a military intervention against Syria.” The consequence of any such intervention, he warned, would be an earthquake that would shake the entire Middle East. 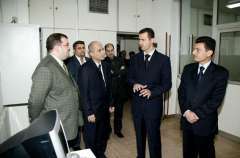 DAMASCUS, (SANA) – In an interview with Russia's Rossiya 1 TV channel on Sunday, President Bashar Al-Assad discussed developments in Syria and the region, Syria's efforts to emerge from the crisis, the dangers and repercussions of any aggression against Syria or interference in its internal affairs, relations with Russia, and western sanctions. 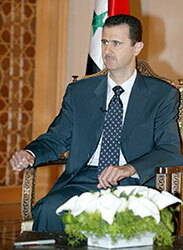 Regarding the likelihood of the west waging an aggression against Syria and the idea that western military action against Syria is preplanned, President Al-Assad said that the claims regarding the possibility of a western aggression against Syria is heard from time to time, particularly during crises between Syria and western countries within the past few decades, and that these claims aim at pressuring Syria to change its political stances. 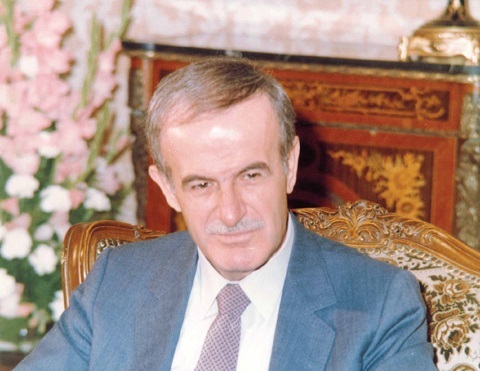 President Al-Assad said that Syria takes all possibilities into consideration even if this issue isn't discussed in the media through leaks, noting that when the homeland is threatened in a military or security fashion, then the balance of power – who is stronger and who is weaker – has no value, adding "if you as a country represent a small and weak country and the enemy is big and strong, it's natural to defend the homeland regardless of balance." 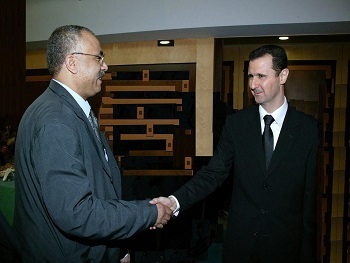 He pointed out that others' considerations regarding the scenario of aggression against Syria aren't easy, and that Syria has a unique position in geographic, geopolitical, historic and other terms, as Syria is the meeting place of all or most the cultural, religious, sectarian and ethnic components of the Middle East. President Al-Assad elaborated by saying that Syria is the meeting place of two "tectonic plates" and that any attempt to destabilize these plates will lead to a massive earthquake that damages the entire region and affects the whole world, adding that any mention of such a scenario would be more costly than the world could afford, which is why it seems that the trend is moving towards political and economic pressure. DAMASCUS, (SANA) - President Bashar Al-Assad on Sunday said that the awareness of the Syrian people have protected the Homeland and foiled the plot seeking to undermine Syria within few weeks. In a televised interview with the Syrian TV on the current events in Syria and the reform project, President Al-Assad assured that the security situation in Syria is better now and that achievements on the security level were made recently. President Al-Assad added "During the latest weeks, the security situation shifted towards the armed acts, particularly last Friday through attacking the Army, police and security posts, assassination acts and ambushing military and civil vehicles… this may seem dangerous regarding the question on if the security situation is better, but in reality we are capable of dealing with all that and we have made security achievements recently which we have not announced yet in order to ensure their success." On the Syrian leadership's security dealing with the latest events, President Al-Assad said "There is nothing called the security solution or the security alternative… there is only the political solution…even the states that go to wage wars, they go only for a political goal, not for the sake of a military purpose… there is no security alterative, but to be accurate, there is preservation of security." 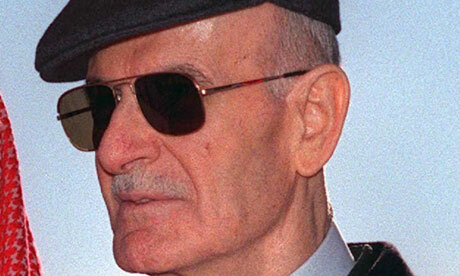 "The solution in Syria is political, but when there are security cases, they must be confronted through the competent institutions…We have chosen the political solution since the very first days of events; otherwise, we wouldn't have headed toward reform as we announced a package of reforms in less than a week after the events began…the political solution can't succeed without preserving security," the President added. "We are at a transitional stage and we will follow up on the laws...there will be elections and a review of the constitution...the most important thing at this stage is to continue dialogue," said the President, stressing "It is unquestionable that there will be a review of the constitution whether the target is Article 8 or the other political items." Concerning the applicable measures and the timetable to implement the elections and parties laws, President Al-Assad said that during the coming days, a competent committee will be formed for the law of parties, compromising the Interior Minister, a judge and three independent personalities, which will receive the applications for the establishment of the new parties. The President pointed out that the local administration law will be ready during the coming few days; accordingly the local administration elections will be conducted three months after the issuance of the law. President Al-Assad said that the media law is supposed to be issued before the end of Ramadan, and that after Ramadan, a committee to study and review the constitution will be formed which will need a maximum of 6 months. As for the elections of the People's Assembly, the President said "There have been several opinions ranging between 4 and 8 months after the issuance of the executive instructions of the elections law. The purpose is to allow a chance for the parties to be formed and be able to compete…the time expected for conducting the People's Assembly elections is by next February." WSJ: We had a lot to ask you before, last week. And now we have even more to ask you about. President Assad: This is the Middle East, where every week you have something new; so whatever you talk about this week will not be valuable next week. Syria is geographically and politically in the middle of the Middle East. That is why we are in contact with most of the problems forever, let us say, whether directly or indirectly. WSJ: Thank you again for seeing us. We appreciate it. Maybe we can start just with the regional situation which is all over the news. As the president of Syria, how do you see what is happening in Tunisia, Egypt, Algeria, and Jordan? How do you see the region changing and eventually, what does that mean for Syria itself? 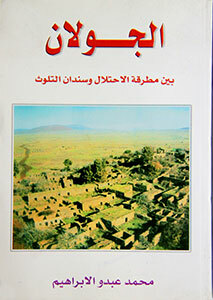 President Assad: It means if you have stagnant water, you will have pollution and microbes; and because you have had this stagnation for decades, let us say, especially the last decade in spite of the vast changes that are surrounding the world and some areas in the Middle East, including Iraq, Palestine, and Afghanistan, because we had this stagnation we were plagued with microbes. So, what you have been seeing in this region is a kind of disease. That is how we see it. If you want to talk about Tunisia and Egypt, we are outside of this; at the end we are not Tunisians and we are not Egyptians. We cannot be objective especially that the situation is still foggy, and not clear. It has not been settled yet. So, whatever you hear or read in this period cannot be very realistic or precise or objective. 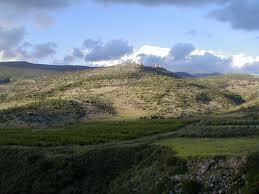 But I can talk about the region in general more than talking about Tunisia or Egypt because we are one region. We are not a copy of each other, but we have many things in common. So, I think it is about desperation. Whenever you have an uprising, it is self-evident that to say that you have anger, but this anger feeds on desperation. Desperation has two factors: internal and external. The internal is that we are to blame, as states and as officials, and the external is that you are to blame, as great powers or what you call in the West 'the international community', while for them, the international community is made up of the United States and some few countries, but not the whole world. So, let us refer to the latter as the 'greatest powers' that have been involved in this region for decades. As for the internal, it is about doing something that is changing; to change the society, and we have to keep up with this change, as a state and as institutions. You have to upgrade yourself with the upgrading of the society. There must be something to have this balance. This is the most important headline. Regarding the west, it is about the problems that we have in our region, i.e. the lack of peace, the invasion of Iraq, what is happening in Afghanistan and now its repercussions in Pakistan and other regions. That led to this desperation and anger. What I tell you now is only the headlines, and as for the details, maybe you have details to talk about for days if you want to continue. I am just giving you the way we look at the situation in general. WSJ: What sort of changes? How would you define the changes that are happening? President Assad: Let us talk about what has not changed till today. Until today we have only two new things but if you want to talk about something new in our life, you have new hopes and new wars. You have a lot of people coming to the labor market without jobs and you have new wars that are creating desperation. So, one is internal and the other is external. Of course, if you want to talk about the changes internally, there must be a different kind of changes: political, economic and administrative. These are the changes that we need. But at the same time you have to upgrade the society and this does not mean to upgrade it technically by upgrading qualifications. It means to open up the minds. Actually, societies during the last three decades, especially since the eighties have become more closed due to an increase in close-mindedness that led to extremism. This current will lead to repercussions of less creativity, less development, and less openness. You cannot reform your society or institution without opening your mind. So the core issue is how to open the mind, the whole society, and this means everybody in society including everyone. I am not talking about the state or average or common people. I am talking about everybody; because when you close your mind as an official you cannot upgrade and vice versa.